A massive blow to the environmental integrity of the Dullstroom plateau & the eco-tourism industry. FOSAF NEWS - A massive blow to the environmental integrity of the Dullstroom plateau & the eco-tourism industry. 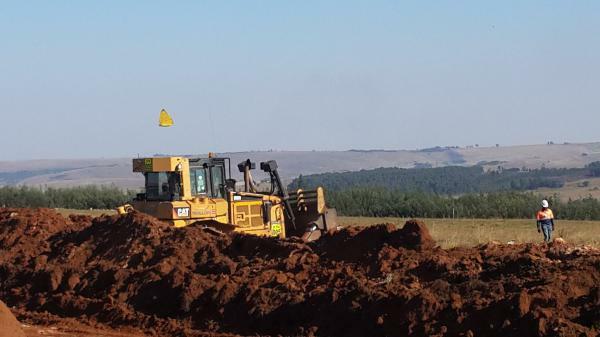 A week ago, the landowners who are served by the key Elandsfontein road on the southern end of the Dullstroom plateau were alarmed to see the ground being ripped up in what is a very ecologically sensitive area. Not only is this an important source of the Elands River which flows through Machadodorp and down to the Crocodile but it also borders the massive Lakenvlei wetland which feeds the Olifants River and is classified in the Mpumalanga Biodiversity Plan as “Irreplaceable”. It then became known that this was in preparation for the opening of an open cast coal mine by WPB Colliery on the land owned by Mr William P Bower. Mr Bowers’ father had a small pick and shovel mining operation on the land and although this was closed many years ago the site still decants toxic water into a stream which the livestock refuse to drink. An attempt was made to apply for a prospecting licence about 10 years ago, but was withdrawn in the face of fierce opposition including Mr Bower himself. Following this WPB Colliery submitted an application for mining and opposition was mounted again and it also saw the birth of the Steenkampsberg Environmental Initiative which has opposed over 20 similar applications in the area. Despite this opposition and the fact that the Environmental Management Plan was shown to be completely flawed a mining licence was granted and this was appealed in 2013. Then the really shocking news came when the DWS granted the water use licence which was also appealed. On April 18 the Centre of Environmental Rights will through the High Court ask the Minister of the DMR why the appeal has not been considered but it is now too late to include a interdict for the closure of the mining operation. What has probably happened is that WPB Colliery which includes the contractors, Trollope Mining, are aware of several threats to their plans. Firstly, the pending court case on April 18 and also the fact that the declaration of the Greater Lakenvlei Protected Environment which borders their site and has been signed off and will soon be gazetted. Although this mining is illegal as their water use licence has been suspended, they also require NEMA authorisation (National Environmental Management Act) and the land must be rezoned they probably reckon it is worth the risk. They know full well that there is little will on the part of the DMR and DWS to enforce their laws. They also know that when the matter eventually comes to court and mining is underway and people are employed the courts are very loath to rule against a mining company. The DMR have already been advised that their client is acting illegally but it is highly unlikely that any action will be taken. The CER cannot assist as they are fully committed financially to the April 18 action and the very important Mabola case where the DEA and DMR have authorised coal mining which will impact the Mabola Protected Environment, a critical source of water for the Vaal, Tugela and Phongola. The same holds true for all the other environmental NGO’s. For more information on this click here. The local landowners in Dullstroom including those with fly fishing venues are thus very much on their own. The cost of court action to stop this illegal mining in the very early stage is estimated to be between R250 000 and R350 000 which is probably far beyond the struggling farming community while the recession has hit the fly fishing venues hard. Sadly, it appears that the miners will once again win. The impact of an open cast coal mine will be devastating and it may be the signal to other would-be miners who are eyeing this area to proceed. The first stages of the WPB Colliery operation.